At the end of last month we celebrated our new website by launching the Sew It Forward initiative. This week, as we celebrate our one month birthday, I would like to say a huge thank you to all those that supported us with our launch event. Designer Henrietta Ludgate generously gave up her workshop in Whiteley’s shopping centre, her own time, and that of her team to help us celebrate in style. 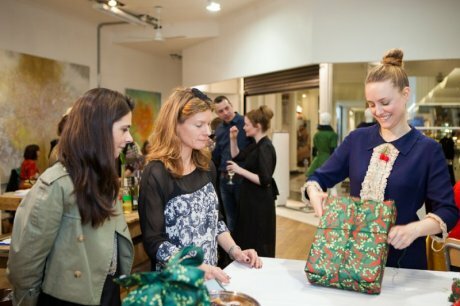 Henrietta is one of the only designers on London’s high streets to produce her collection on site - the fact that she also sources ethically produced cloth made her the perfect designer for us to collaborate with for our launch. 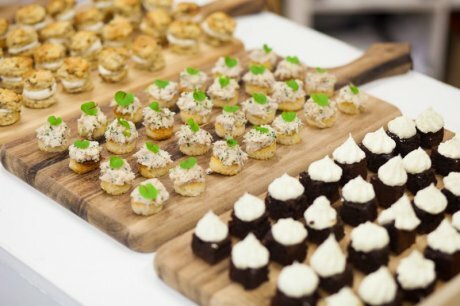 I was extremely fortunate to have the support of award-winning caterers Squid & Pear who provided delicious canapés for our guests. Founded by sisters Lisa and Claire Drabble, Squid and Pear were the first caterers to receive the maximum three star sustainability rating from the Sustainable Restaurant Association. 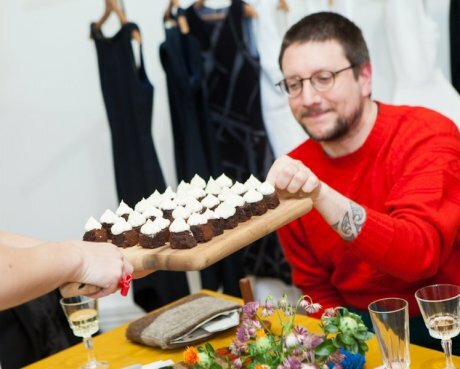 In the same way we believe slow fashion should also be stylish, Squid and Pear believe their ‘sustainable street food and ethical event catering’ should look fantastic and taste even better. 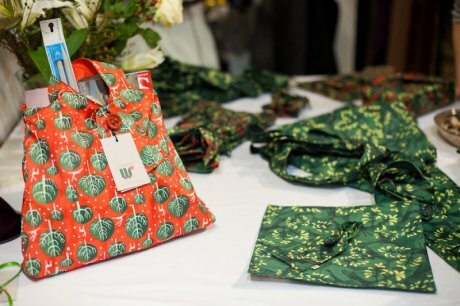 We teamed up with Wrag Wrap who very generously supplied their gorgeous gift wrap bags for all of our guests. Not only were they very useful bags for guests to take their other goodies home in, but with such lovely designs to boot, they are a great gift in themselves. The founders Louise Oldridge and Nicky Rajska were also on hand at the launch to show guests just how easy it is to use their wraps. I was extremely grateful to Campaign for Wool who gave us some very cute woolley sheep key rings for the goody bags, and for arranging some amazing support from Rowan. As the launch was geared towards sharing skills, we needed some seriously talented people to help us out. Rowan not only sent us a crack team of knitters to pass on their talents, but they also generously supplied us with yarn, needles and patterns books. Guests went home armed with new skills and gorgeous knitting goodies to practice with. Thanks to the knitters Emma, Natalie and Georgina for your wonderful contribution to the event. Special mention must go to master mender Juliette Stuart, who volunteered her time to help us set up and spent the whole evening teaching guests to mend and stitch. It was also lovely to have Juliette’s daughter Cyan there too. Interestingly, they have never found the opportunity to sit down together and sew before and it was lovely to see Juliette sharing her skills with her daughter. Darning guru Tom of Holland was a guest at the launch but he brought along the tools of his trade and shared his darning wisdom with us all. We were in fact so impressed that plans are afoot to run a darning workshop with Tom. Watch this space. One of my favourite photos of the event shows Tom, with a gleam in his eye, about to sample a Divine Chocolate brownie. Made by Squid and Pear with chocolate from Divine, these were some of the best brownies I have ever tasted. Tom obviously thinks so too. I love a bit of mending but I wanted to give guests the opportunity to do some customising too. Pants to Poverty kindly sent us some of their undies and guests were given free reign to get creative. 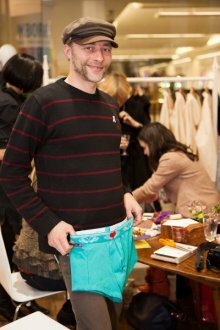 James Gilley, founder of social enterprise SPAT appliquéd his brother’s initials onto a pair for a personalised Christmas gift, while artist Samuel Birch added a heart to his new briefs. Other wonderful goody bags contributions came from Green People who sent us some beautifully packaged environmentally and skin friendly travel-size cosmetics, The Visionary Soap Company who supplied their gorgeously-scented organic soaps and bath melts, Ecover who sent us samples of their eco-friendly laundry products, Homes and Gardens who gave us copies of their December issues for some festive inspiration, and Thames and Hudson who supplied a discount voucher for The Sustainable Fashion Handbook by Sandy Black. Photographer Susanne Hakuba captured the mood and activities of the evening perfectly and I am very grateful to her for giving up her time to be involved – all of her splendid images have further helped to spread word about Sew It Forward. More of Susanne’s images from the event are on our Facebook page. 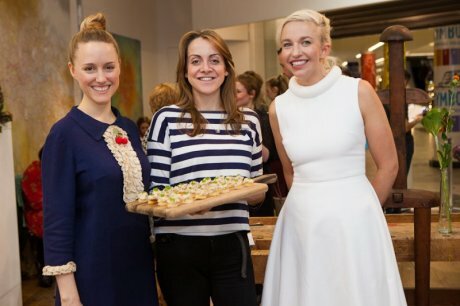 Thank you to the London Sustainable Development Commission, Paula Owen Consulting and Nicola Woods from Beautiful Soul for your support at the event and to Teacake Tuesday and Xposure Media for the lovely film of our launch. You can read more about the Sew It Forward initiative and download the voucher for free from our Sew It Forward gift voucher blog. All photographs by Susanne Hakuba.